Ragi or finger millet is a super grain full of vitamins ,minerals,fiber,protein,anti-oxidants etc etc .They are gluten free,good for diabetic people,people who are trying to lose weight and also for people who want to look young (Holy grail!!). 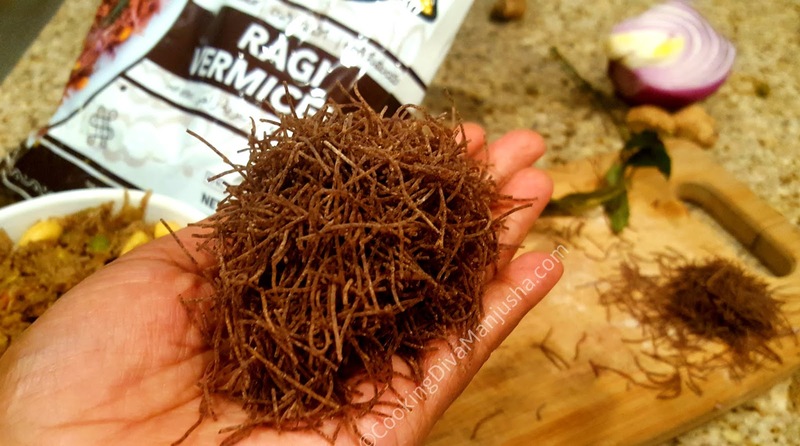 Yes,this humble grain has got everything covered it seems like a natural multi-vitamin grain-y tablet from mother nature .In India ,especially in South India,ragi is a staple food item .Many amazing recipes are made with this super healthy grain . There was a time when I thought ragi seeds and mustard seeds are non-identical twins.To be frank ,I was not that into ragi.For me, it tastes so bland and is quite dense in texture .Up until my mother recommended ragi cereal for my baby and the immense health benefits it has to offer .Amma packed a bagful of ragi for the baby while returning from India to US .It was so much that I wanted to try a few recipes as well to finish it before it goes stale and I started researching about all the health benefits of finger millet and I was totally taken aback . 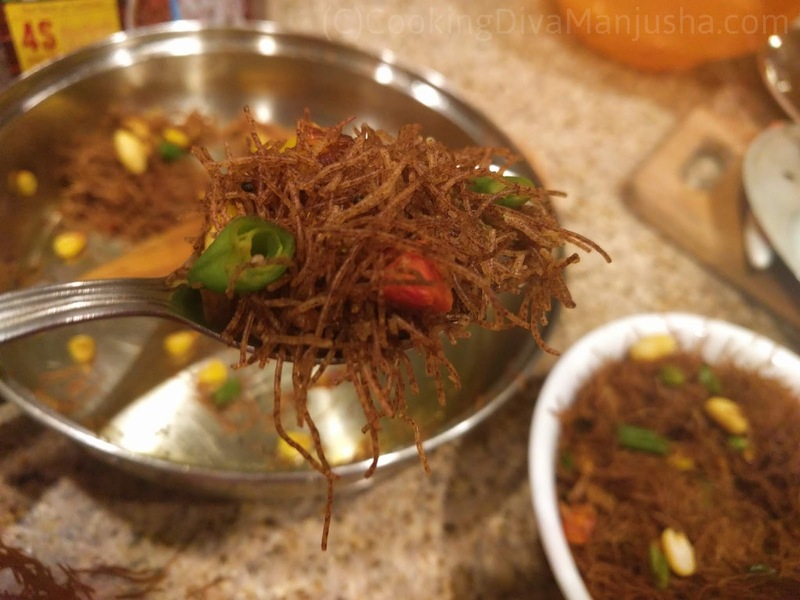 I realized,making ragi vermicelli upma unlike other vermicelli upmas was not a child's play.It was like how we should manage and maintain any relationships .You see,ragi vermicelli is quite tender,delicate and we have to be very careful ,understanding and so lovingly handle them or else it will be a piece of mess. It will be very heartbreaking I tell you !! 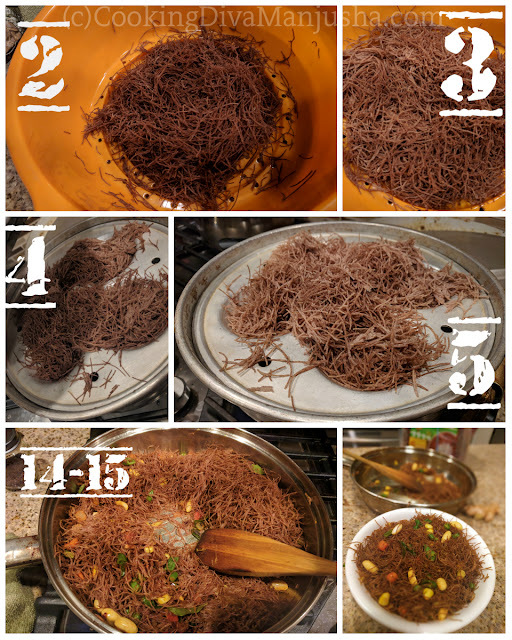 I was not going to give up on ragi vermicelli that easily (just like my any relationships).So,my second attempt with ragi semiya/vermicelli was a huge hit with my family .Even the ragi hater,me,loved it !! Green chilli,chopped - 1-2 Nos. Heat some water and let it cool down a bit .It should be between warm and lukewarm . 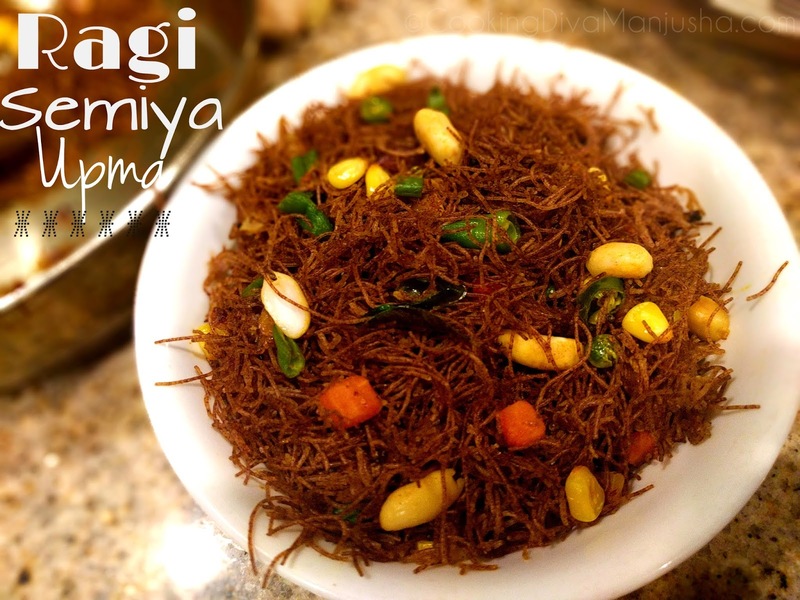 Put the ragi vermicelli into a strainer and pour this warm water over it. Let the water get strained away and let the ragi sit like that undisturbed just for a minute.Not more than that or it will loose its texture. Now heat some water in an idli maker or any steamer . Put the wet ragi into it and steam it on low-medium flame for 2-3 minutes . Now,heat oil/Ghee in a pan and roast some peanuts .Keep it aside. Side by side ,heat oil/ghee in a pan and splutter mustard seeds followed by cumin seeds and asafoetida . Add onions ,green chili and ginger .Saute for a minute or two. Then add all mixed vegetables (carrots,beans,green peas,corn and potato) and saute well. Add a tbsp of water and bring everything to the center , cover with a lid and let everything get cooked . 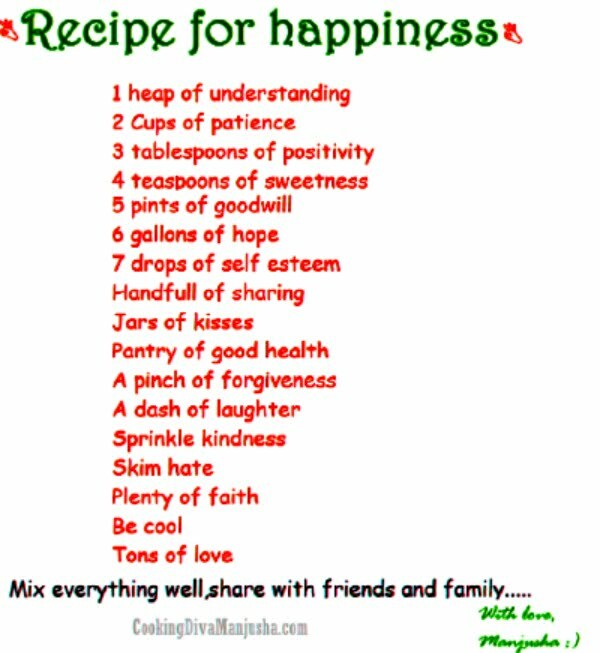 Add the roasted peanuts into it.Mix well. Add curry leaves,turmeric powder ,chilli powder and salt to taste. Finally ,add the cooked ragi vermicelli from the idli maker into it and mix everything well very gently. 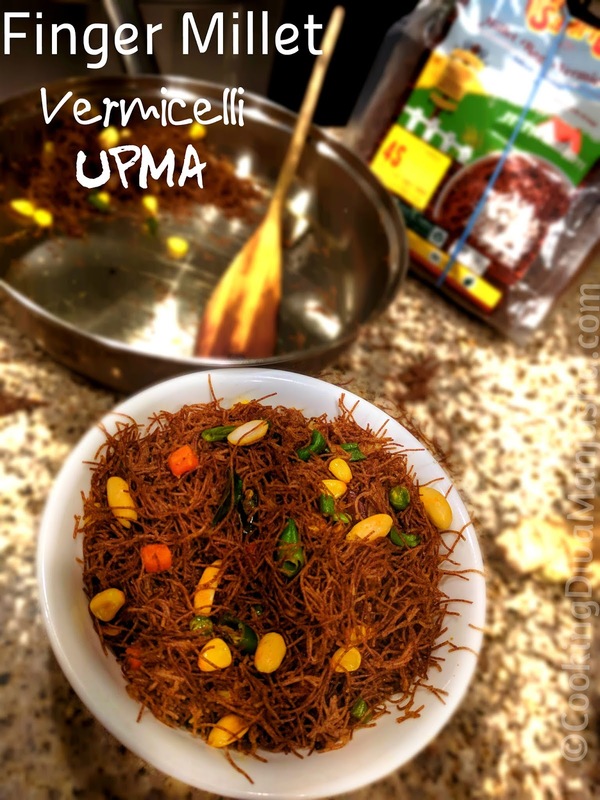 Put off the flame and that's it my yummy and nutritious Ragi vermicelli upma is ready to eat. I microwave the peanuts quickly like for a minute or it can also be roasted in the same pan after spluttering mustard seeds and cumin .It may take little more time though . Pouring warm water and then steaming the ragi semiya makes sure that the ragi gets cooked perfectly without breaking down or becoming clumpy and tasteless. Adding potato to this upma makes it really yummy.